The Legend of Korra: Pro-bending arena board game is Live on Kickstarter! THE LEGEND OF KORRA: PRO-BENDING ARENA is board game set in the Avatar universe from Nickelodeon’s global smash hit Avatar: The Legend of Korra. A miniatures board game designed by Sen Foong-Lim and Jessey Wright, The Legend of Korra: Pro-bending Arena pits 2 players against each other in a sports game that features deep, strategic, head-to-head gameplay, highly detailed and dynamic miniatures, deck crafting and building, and team customization. Based on the events of Avatar: The Legend of Korra, Pro-bending Arena focuses on the championship match between the fresh-faced Future Industry Fire Ferrets and the sneaky and brutal White Falls Wolfbats. The objective of the game is simple: be on the other team’s side of the arena when the game ends and you will be victorious, or dominate the competition, pushing all their benders off the back of the arena to end the game immediately and claim the championship as yours! We will reveal a new item for your pledge almost every day during the campaign. These revealed items are guaranteed as part of your pledge. Each day we’ll invite you to return to our campaign page to learn which team, trick cards, or component upgrade we’ve unveiled. The Legend of Korra: Pro-bending Arena Deluxe Edition is exclusively available through Kickstarter. Make sure you back today to guarantee your access to all the incredible rewards! 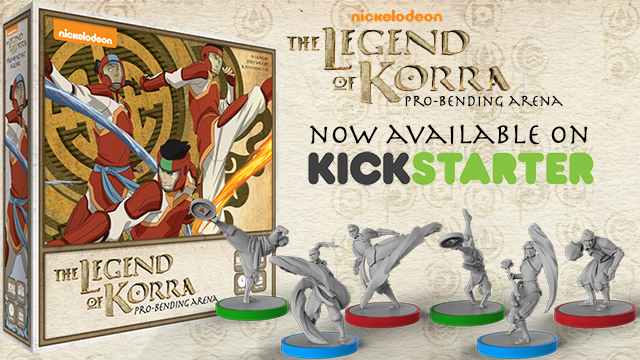 ← Legend of Korra: Pro-bending Arena Kickstarter Launching September 13th!